Chicano Studies is a comparatively new academic discipline. Unlike well-established fields of study that long ago codified their canons and curricula, the departments of Chicano Studies that exist today on U.S. college and university campuses are less than four decades old. In this edifying and frequently eye-opening book, a career member of the discipline examines its foundations and early years. Based on an extraordinary range of sources and cognizant of infighting and the importance of personalities, Chicano Studies is the first history of the discipline. What are the assumptions, models, theories, and practices of the academic discipline now known as Chicano Studies? Like most scholars working in the field, Michael Soldatenko didn’t know the answers to these questions even though he had been teaching for many years. Intensely curious, he set out to find the answers, and this book is the result of his labors. Here readers will discover how the discipline came into existence in the late 1960s and how it matured during the next fifteen years-from an often confrontational protest of dissatisfied Chicana/o college students into a univocal scholarly voice (or so it appears to outsiders). Part intellectual history, part social criticism, and part personal meditation, Chicano Studies attempts to make sense of the collision (and occasional wreckage) of politics, culture, scholarship, ideology, and philosophy that created a new academic discipline. Along the way, it identifies a remarkable cast of scholars and administrators who added considerable zest to the drama. 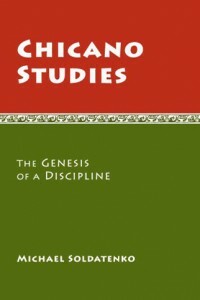 Chicano Studies: The Genesis of a Discipline. U of Arizona P, 2011.